Early season goose hunting can be feast or famine for hunters. These hunts are intended to manage resident goose populations which in many states are far above population goals. This burgeoning population allows for higher bag limits during the early season, a season that didn't exist in many states until recently. In my home state of Wisconsin and in most other states offering an early goose season, the giant Canada subspecies is the targeted bird. Giants are the biggest species of Canada goose and are the favorite among many goose hunters. Due to their size and resistance to cold weather, many of them never migrate from their home range. However, hunting them in early September is different than a late season hunt. One of the main differences between hunting resident geese and hunting migratory geese is knowledge of the area. Resident geese know the area well and since they usually only fly a few miles to their feeding destination they are more predictable than migratory geese. This can be an advantage for the prepared hunter and a huge disadvantage for hunters who haven't scouted. Being on the "X" is more important during the early goose season than during the late season. These geese know where they want to go. If you are where they want to be, the shooting can be fast and furious. If not, be prepared to enjoy a morning of watching geese fly into a neighboring field. The common consensus among most early goose season hunters is to bunch decoys in family groups of five to seven decoys. Many early season spreads consist of four or five family groups spread over a chosen field. I have hunted over several decoy spreads like this and can vouch for their effectiveness. However, I prefer a spread similar to a late season decoy set, just smaller. I'll set 15 to 25 decoys in a random pattern downwind from our field blinds. The decoys are placed in a U-shaped configuration which creates a landing zone for approaching geese. 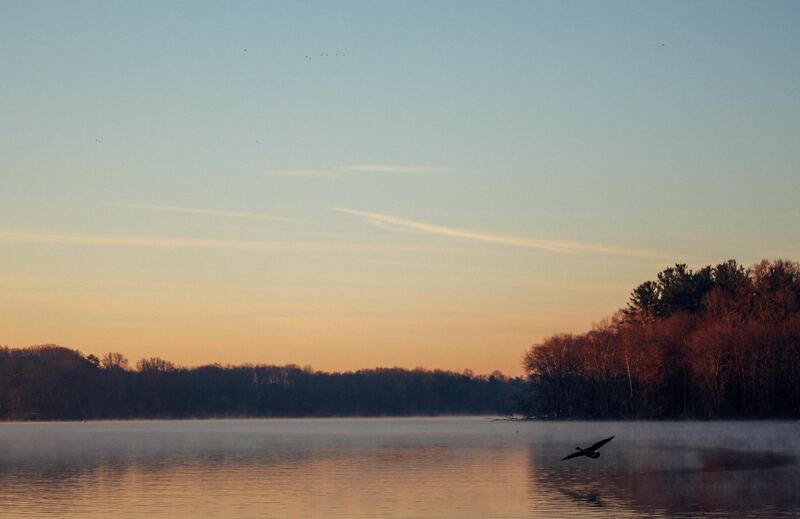 Sleeping in is a no-no when it comes to early goose season. Geese may feed three times per day in the bitter cold of January. In early September, they usually head out to the fields first thing in the morning and they may not return the rest of the day. Geese will often feed in the afternoon as well but in my experience, the afternoon trip is not as predictable. It's imperative to be in the fields and ready to hunt as the sun rises. If the scouting and conditions are good, you may be limited out by 8 AM. If the above suggestions are followed, it won't take much calling to bring geese to the decoys. They want to be where you are. 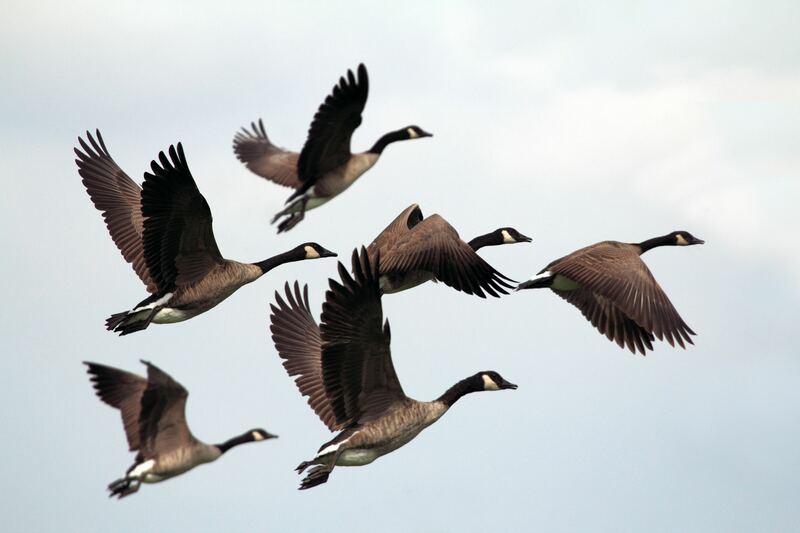 If you see geese working another direction, by all means give them a few notes. But if you did a good job scouting, the birds are headed your way anyway. I'll give them a few light honks and moans to get their interest but as soon as they set their wings, it's time to put the call down and get ready to shoot. A good portion of early season flocks are comprised of juvenile birds. There is no need to take long shots. You will get at least some part of the flock to break off and fly right into your spread. In your face goose hunting! Cold weather is not a factor in early goose season hunting. However, there are other obstacles to be aware of. Layered clothing is essential. Most mornings in Wisconsin are sweatshirt weather. A few hours into the day, t-shirts are all that's needed. Another thing we don't think about in November is insect repellent. Thermacells are also hot commodities this time of year. Don't forget about your hunting partner either. Dogs may not need a lot of water midseason, but in the heat of early September fluids are crucial. I'll also bring along some Benadryl. Bees, wasps, and poisonous plants can cause an allergic reaction in your pooch. A strong antihistamine can mean the difference between getting to the vet in time and tragic consequences. Even if you know your dog isn't allergic to stings, the antihistamine will make him more comfortable while you continue to hunt. Early season goose hunting can be some of the best goose hunting of the season. The birds are easier to pattern and the limits are liberal. More importantly, it's usually the first opportunity of the year to go hunting.